Sacroiliac joint dysfunction is a painful condition of the sacroiliac joint. It is one of several problems, along with sacroiliac (SI) joint syndrome, SI joint strain, and SI joint inflammation, that have pain as a symptom. The SI joints are formed by the connection of the sacrum and the right and left iliac bones. The sacrum is a triangular-shaped bone and consists of five segments, which are fused together. The sacrum and the iliac bones (ileum) are held together by a collection of strong ligaments. The SI joints connect the spine to the pelvis and there is very little motion at the SI joints. As with other joints in the body, cartilage covers the bone in the SI joints, which allows for some movement and acts as a shock absorber between the bones. These joints support the entire weight of the upper body, which places a large amount of stress on this area. 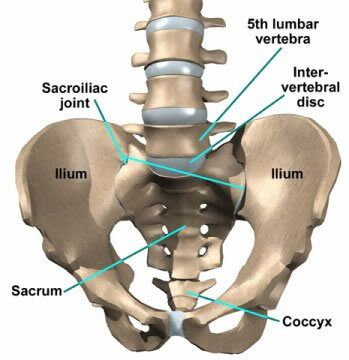 Sacroiliac joint dysfunction occurs when the cartilage is damaged or worn away and the bones begin to rub on each other. This condition is known as degenerative arthritis or osteoarthritis, and occurs in weight bearing joints of the body. Pregnancy – hormones released in a pregnant woman’s body allow ligaments in the sacroiliac joint to relax, preparing the body for childbirth. Relaxation of the ligaments allows for increased motion in the joints and can lead to increased stresses and abnormal wear. The additional weight and change in walking pattern associated with pregnancy also places additional stress on the SI joints. Any condition that changes the normal walking pattern can place increased stress on the SI joints. Patients with severe pain in the lower extremity often develop problems with either the lower back (lumbar spine) or SI joints. In most cases, if the underlying problem is treated the associated lumbar spine or SI joint dysfunction will also improve. The most common symptom of SI joint dysfunction is pain in the low back or hips, although pain may also be felt in the groin and thighs. Pain is typically worse with standing and walking, and improves when lying down. Inflammation and arthritis in the SI joint can also cause stiffness and a burning sensation in the pelvis. Physical therapy to learn various stretching or stabilizing exercises that can help reduce the pain. Sacroiliac (SI) joint block injection. An anesthetic material such as Lidocaine along with a steroid (cortisone) can be injected directly into the SI joint. This is usually performed with the aid of a fluoroscope to verify the injection is in the SI joint. The anesthetic and steroid help to relieve the pain from inflammation that is common with SI joint dysfunction. The duration of pain relief varies from days to months. Oral anti-inflammatory medications are often effective in pain relief as well. Surgery is also an option if other treatments fail and pain continues, but this should only be considered if other less invasive treatments are not been successful. An alternative treatment for SI joint dysfunction is Platelet-Rich Plasma (PRP) . Platelet-rich plasma is derived from the patient’s own blood. The resulting plasma is a concentration of growth and healing factors, and is injected into the affected area. Platelet-rich plasma has been useful in a variety of joint, tendon and ligament injuries that are resistant to normal measures of healing. Hear one patient’s testimonial following her PRP injection for SI joint dysfunction. If you continue to suffer with sacroiliac or SI joint dysfunction and your current treatment plan leaves you feeling hopeless, perhaps a fresh set of experienced eyes can change your outlook. Since 1990, Dennis M. Lox, M.D has applied his personal interests in sports medicine, cutting-edge regenerative medicine and chronic pain management to helping patients increase their quality of life. Contact us for an appointment at 727-462-5582. Dennis M. Lox, MD, and the Florida Spine Center serve patients within the greater Tampa Bay area, including Clearwater, Tampa and St. Petersburg, as well as all of Florida and the US. All statements, information or opinions provided by this website are provided for educational purposes only. We do not diagnose nor treat through this website or by telephone. As you consider any treatment, discuss them with your physician. Regarding platelet-rich plasma or stem cell therapy: Neither statements nor treatments have been evaluated by the FDA. We do not claim that these treatments work for any listed or unlisted condition. Patient testimonials offer only the patient’s impression of how a therapy worked for them – individual results will vary; results are not guaranteed nor warranteed. As you consider any treatment, discuss them with your physician.